Setting CRC hack to aggressive made the problem worse. There are also seems to be slowdown in random places when walking, despite emulation speed remaining constant at 100%. I don't remember it doing that when I played the game on real hardware, but that was some time ago. All non-default setting are outlined in the first post, as they were things I found to try in other other posts. As stated, the game is Digital Devil Saga Undub. I'm running the ISO but there is no difference in trying to run my US or JP discs. I have tried all interlacing settings and reducing the resolution to native. Some interlace settings made the problem worse, but it's more of a pick your poison scenario with the two blend options. Your screen might just be shaking due to interlacing so you could try a different setting after you upgrade. The interlacing actually decreased the shaking in 1.4.0, but didn't eliminating it. Using the newest beta eliminates the 9th generation VHS copy effect. However, the game won't run at the proper speed. Depending on what is happening at any given time, it runs at 90%-140% speed. Any suggestions for things to tweak with this? 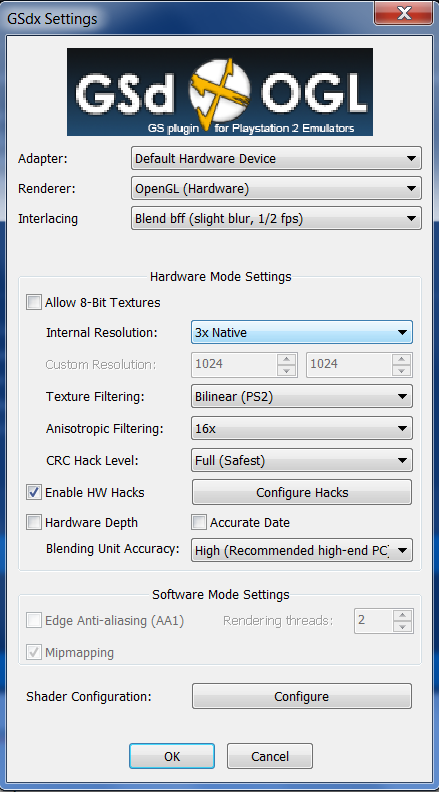 What speedhacks and GSdx settings are you using?